You take the time to create great content for your target B2B buyers. Maybe you even create paid ads and target them right at those buyers. And then…. nothing. What happened? Here’s one of the most common reasons why B2B content and ad targeting frequently fails. 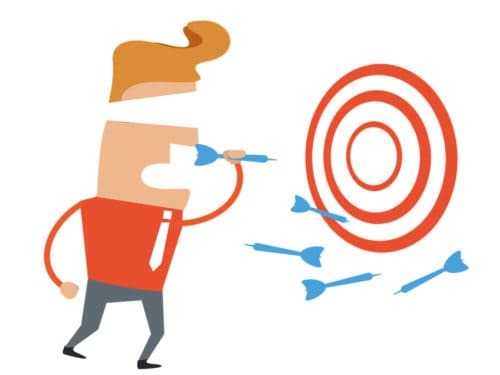 Why does B2B content and ad targeting so frequently miss the mark? Often it’s because marketers fail to realize who their target audience REALLY is. B2B content is almost always targeted at the end buyer. The person who signs the check and makes the purchase. They may be the buyer, but they’re not the one your content generally needs to be for. And that’s where so many make the mistake. Say you’re a large IT product company. You may assume that because the CTO is the one making the buying decision, they’re the right person to be targeting with your B2B content and ad targeting. The reality is, a CTO isn’t spending their day searching for solutions, evaluating features, comparing options, viewing product demos, building a case, and then making the final call all on their own. Sorry, but that type of work is far below their pay grade (at least at any decent sized company). Instead, it’s far more likely that someone (or multiple people) below the CTO are doing those things. It could be their direct reports or even the end users. These are the people you should really be targeting. So how do you find the right targets for your B2B content and ads? There are a couple options, though some will get you the answer faster than others. You could create content for all levels of the area of an organization within your target industry, then measure the response to each and see which are the most successful. While that may get you some answers, it’ll also take quite a bit of resources and time. It could also result in false positives, such as content that performs well for some KPIs but fails to move people through the funnel. There’s a better option. The best way to find out is to ask your customers. Learn who within the organization is involved in the buying process. Not just the person approving the purchase order and signing the final check, but each person involved from start to finish. Once you know exactly who’s involved, targeting them with content and ads becomes far easier and will return much better results. Often the reason our efforts fail is misunderstanding our audience. What may seem obvious upfront isn’t true in reality. By digging deeper and really knowing all those involved in the buying process, we can better create content and target ads for those folks with much better precision. Look at who your efforts are targeted at. Are they really the people you should be courting at that point in the process? Sometimes to know your audience, you just need to ask.